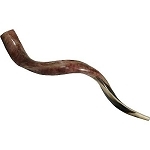 This traditionally handcrafted Yemenite Shofar is just what you need for the Jewish High Holy Day season. Fully polished and Certified Kosher, it features a conventional mouthpiece for easy blowing. Please note: Size: 71-76 cm / 28-30 inch.